NZFFA Council Meeting will be held on 3 November at the Miramar Links Clubhouse, near the Wellington Airport. More detailed information is about to be sent to branch officers. Action Group Weekend will be held on 4-5 November, Wairarapa. The Action Group Weekend is being hosted by the Indigenous Section and the Wairarapa Branch. More information to follow. Nominations can be submitted to NZFFA National office at any time, but must be received by 1 November (to allow time for judging) to be eligible for presentation at the ensuing Conference (next = Nelson in May 2018). Nominations received after 1 November are held over for judging for a subsequent Conference. Note that nominations are submitted by branches, and so if you know of a worthy recipient, contact your branch officers. Nomination forms are available on the NZFFA website or may be requested from National Office. Husqvarna Farm Forester of the Year North Island and South Island: Our two prestigious awards for farm forestry achievement. Prizes are a Husqvarna chainsaw and custody of the engraved plaque for a year. Recipients must be present at Conference. Judging criteria include personal effort in tree planting and results, service to community, depth and spread of knowledge, and service to NZFFA. NZ Landcare Trust Award for Innovation in Sustainable Farm Forestry: Awarded by NZ Landcare Trust for innovation as in the title. Prize is $2,000. Usually awarded to a recipient residing in the same island as the Conference is being held (to facilitate the recipient being able to attend to receive the prize). Michael Hay Award: Awarded by the Michael Hay Trust to a younger farm forester who is actively planting trees. Prize is $5,000 to be spent on further plantings. The award is judged by an independent panel and the initial assessment is on a desktop basis – hence the importance of descriptive documentation and photographs in support of the nomination. Will the application of plant hormones to trees improve wood quality? Red needle cast (RNC) is a disease that infects pine trees and Douglas-fir needles. Infected needles turn yellow then red and are cast or blown off the trees a few months after symptoms appear. It is caused by the algae-like organism Phytophthora pluvialis. In early July Benjamin Lee, well-known and longstanding NZFFA member died suddenly at his home in Reporoa. 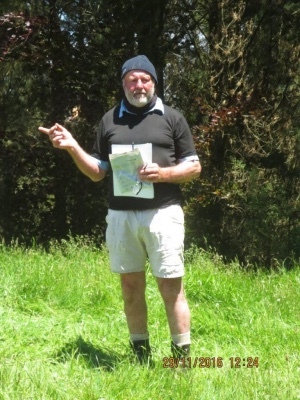 Having taken over the 187 hectare ex-Lands & Survey farm on the edge of the Kaiangaroa Plateau from his parents Alan and Dorothy Lee (both founding members of the NZFFA themselves), he and wife Sylvia spent the next couple of decades establishing 32 hectares of woodlots while converting the block to a high performing dairy unit. While a lot of logs left the farm and headed to the port as export during Ben’s time he seemed most proud of that wood which he was able to grow and use himself…….poplar for cattle yard posts, macrocarpa for his brothers housebuild, redwood and douglas fir for farm building projects and eucalyptus for their new kitchen floor. Ben has been a rock of the Taupo and Districts Branch for many years having held just about every position going. He was president for a number of years, newsletter editor and councillor. On a national level he chaired the Cypress Action Group. Back in 2005 the Taupo Branch held the National Conference and once again Ben took on the leading role as convenor and made it a great success showcasing farm forestry on the Volcanic Plateau. That same year he and Sylvia were awarded the Innovation in Sustainable Farm Forestry Award. This was for the successful incorporation of forestry, shade trees and shelterbelts into a dairy operation. Over the years Ben and Sylvia would head off to attend the national conference and it never ceased to amaze us the spots this took them. It seemed like they had just about been up every gravel backcountry road in both the North and the South looking at farms and trees. Whether it was helicopter logging native on the West Coast or converting a run-down sheep station into a redwood forest at Conway Flat, they had a story to tell about every farming district in NZ it seemed. Benjamin Lee…..respected farmer and forester. Passionate, intelligent, very matter-of-factly and well worth listening to………‘A good buggar’. Kyle Brennan, on behalf of the Taupo and District Branch Committee.